Good with numbers? You’re more likely to have a bigger savings pot. You’re also probably better at keeping up with the bills. And probably putting money away more often that someone who struggles with numeracy. This might seem obvious, but a report published earlier this month by the Money Advice Service provides the strongest evidence to date on how good number skills help people manage their money and keep out of debt. Numeracy and Financial Capability: Exploring the links, found that 18.5m adults, nearly half the UK working-age population, have ‘poor’ or ‘low’ numeracy skills, and these adults are less likely to save money and more likely to fall behind with bills than those with ‘moderate’ or ‘high’ numeracy skills. It is important to stress that this is not down to having a better job, earning more, higher educational qualifications, gender, ethnic background or attitudes and beliefs. The background research controlled for all these factors. If you struggle with a question such as ‘You are paid £9 per hour and get a 5% pay increase. What is your new rate of pay?’ then you are unlikely to be financially capable. Somewhere between a quarter and half the adult population would struggle with the question above, so the scale of the issue is huge. But to date the strong link between good number sense and good money sense has not yet fed into financial capability and debt advice interventions in a systematic way. There is also little recognition of poor numeracy within the ‘customer vulnerability’ discourse. Although poor numeracy was identified as a customer vulnerability in a FCA paper on this topic in 2015 (Occasional paper 8), it is only if you do a bit of maths and compare all vulnerabilities on a like-for-like basis that you get to see that poor numeracy is by far and away the biggest, affecting 1 in 2 adults. Where there does seem to be a lot of Financial Services focus is on the provision of financial education in schools. Whilst this would appear to be a no brainer for helping future generations, international research shows scant evidence of impact of financial capability programmes in schools. In addition, even if financial education in schools does have impact, and everyone coming out of the education system was trained perfectly to manage their finances, this would have no discernible impact on adult financial capability for at least a decade. So along with supporting generations of school leavers to be financially capable when they become economically active, we can also start making a difference to the lives of millions of UK adults right now. National Numeracy has evidence that adults can improve their numeracy skills and confidence quickly, without needing to go back in to education. Our online route to helping people to get the Essentials of Numeracy is helping thousands to do so at www.nnchallenge.org.uk. Given the increased household debt burden and the current economic uncertainty, it is now more vital than ever that we work together to address this underlying challenge – through improving numeracy raise levels of financial competence in the UK. 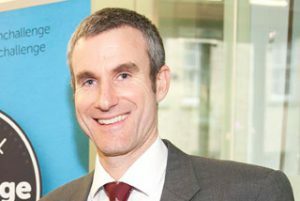 Mike Ellicock is the Chief Executive of National Numeracy, an independent charity established in 2012 to help raise low levels of numeracy among adults, young people and children across the UK and to promote the importance of everyday maths skills. It provides a free online tool which allows anyone to find out whether they have a good grasp of the Essentials of Numeracy, and work towards achieving them if need be.